Note from Mommypotamus: Hey guys, I’m sorting through what needs to go to the house and what needs to go to storage for our next big adventure! 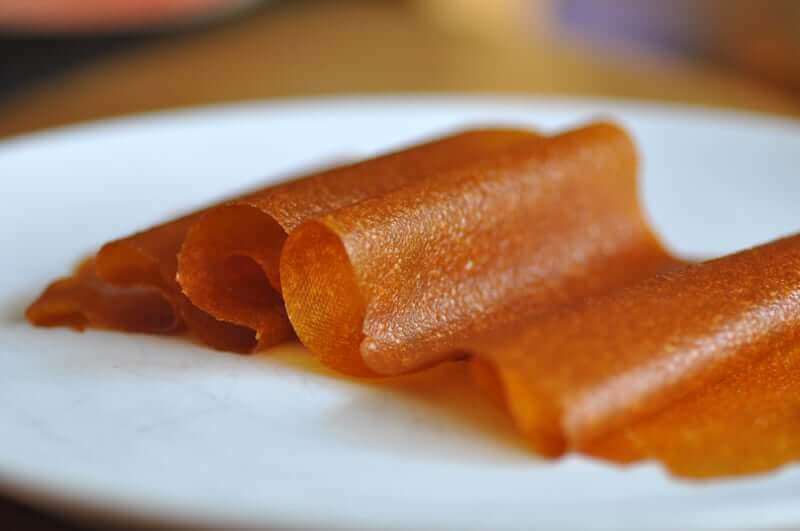 While I’m packing, Dawn from Small Footprint Family has agreed to share her fabulous recipe for cultured apricot fruit leather – thank you Dawn! Apricots Are Always . . . The earliest stone fruit to come into season, and for many people, their arrival signifies the beginning of summer. This weekend the farmer’s market had lovely, sweet organic ones for just $1.50 a pound, so I bought a crate of them. I plan to eat them fresh, dry some, and make the rest into fruit leather. Originally from China, apricots (Prunus armenia) were much-prized fruits first brought to Armenia by Greeks who called them “golden eggs of the sun.” Today, the most important commercially producing countries are Turkey, Iran, Italy, France, Spain, Syria, Greece, and China. The apricot tree came to Virginia in 1720 but wasn’t truly established as an American crop until its arrival in California around 1792. The climate in California is perfectly suited to apricot culture, and most U.S. apricots are grown there. Botanically, the fruit is closely related to peaches and nectarine, and grows best in well-drained mountainous slope soils. Apricot trees are one of the earliest producing fruit trees and, because they are self-pollinating (meaning they do not need more than one tree to bear fruit), they can be grown in a small yard. Pink or white flowers bloom in early spring, followed by fruit in May. A standard-size tree produces three to four bushels of fruit yearly. Apricot trees do not begin producing fruit until the third to fourth year after planting. Apricots are an excellent source of beta-carotene, a very good source of vitamin C, and a good source of potassium. They even contain a little tryptophan, which is a difficult, but essential amino acid to get in your diet. Apricots also contain phytochemicals called carotenoids, which are compounds that give red, orange and yellow colors to fruits and vegetables. The powerful antioxidant Lycopene is one of the carotenoids found in apricots. 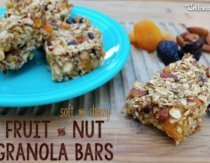 Apricot seeds, also called “kernels,” are also edible and taste wonderfully like almonds. Some people think that apricot kernels help fight cancer. Oil extracted from the seeds is used in cooking and makes a wonderful skin care oil. Apricot season in the U.S. runs from May to August. Look for fruits with a rich orange color or even a blush of pink, and avoid pale and yellow fruits. Apricots should be slightly soft. If they are too firm, they have not been tree-ripened, and tree-ripened fruits always taste best and have the most nutrition. Wash fresh fruits gently in cold water and pat dry with a soft cloth. 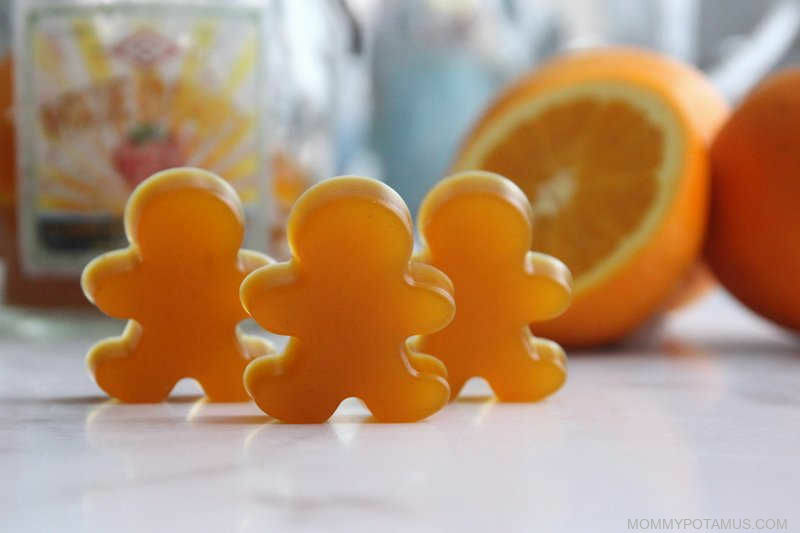 Add fresh apricot slices to lunchboxes, salads and cereals, make them into jams, syrups and brandy, or simply sun-dry them and chop them into raisin-size pieces to use in baked treats. One of the easiest and most kid-friendly ways to preserve fresh fruit is to make it into fruit leather. But since fruit leathers can be very sweet and hard on the teeth, I thought I would bulk up the nutrition a little by culturing the fruit first, so it had a nice tangy taste and a healthy dose of probiotic bacteria for oral and digestive health. Note From Mommypotamus: If you want to cut the time needed to make fruit leather down to a day or so, you can skip the culturing process. Just puree the apricots, spices and sweetener listed above and move on to “Drying the Fruit Leather” below. Prepare the fruit (core apples, remove unwanted seeds or skin, etc.) and cut into pieces. Process the fruit in a blender, food processor or through a food mill until the mixture is smooth. Mix in the salt, spices and sweetener, to taste. Prepare the starter culture according the instructions that came with it, then mix it into the fruit mixture. If using whey, add it now. Place the fruit mixture into a canning jar, leaving 1-2 inches of headroom, and place a lid on the jar. Wrap the jar in a towel to block out light and allow the jar to sit in a warm spot (70-80°F) for 7-10 days. Be careful when removing the jar lid, because pressure may have built up. Line dehydrator trays (or baking sheets if using the oven) with sheets of unbleached parchment paper or Paraflexx/Teflexx. 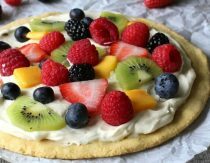 Spread the fruit mixture evenly and very thickly on the sheets. If the mixture is too thin, strain it through a nut milk bag, tea towel or tight weave cheese cloth to thicken it up. The strained juice is delicious and contains beneficial bacteria from the culturing process. 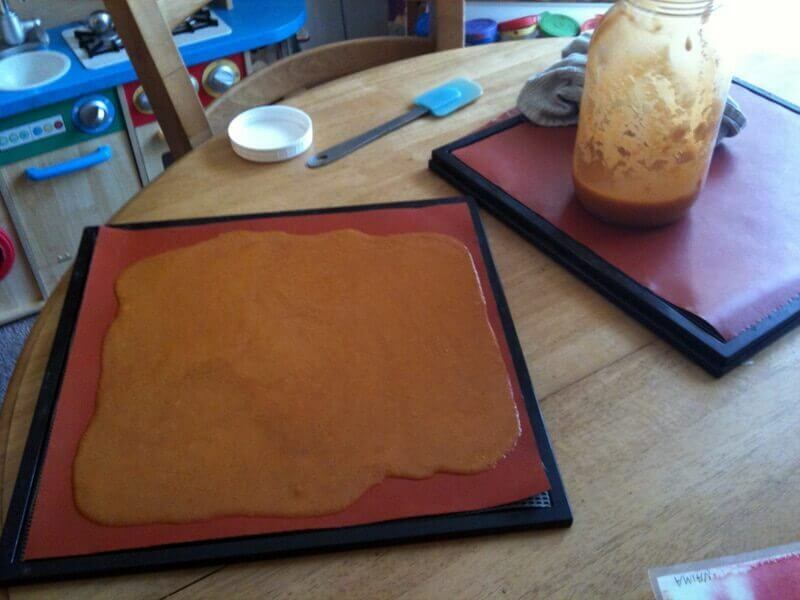 Set your dehydrator (or oven) for 110 degrees and allow the fruit leather to dry for 8-24 hours. (Don’t set it any higher than 110, or you’ll kill the beneficial bacteria you just cultured!) The exact length of time will depend on the thickness of the mixture, so be sure to check on it regularly. 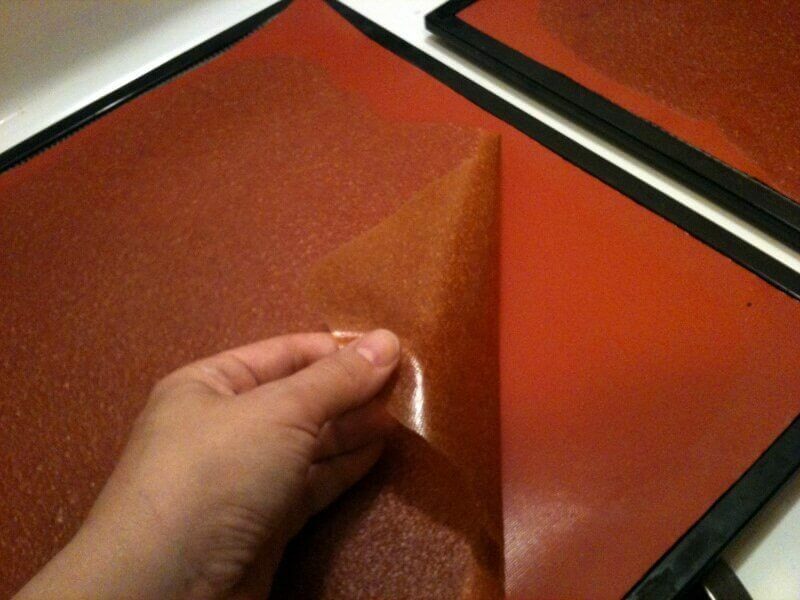 The fruit leather is done when it is no longer sticky. Peel the leather away from the parchment or Teflexx sheets and tear it into strips. Store in an airtight container and keep in the fridge for lasting freshness. 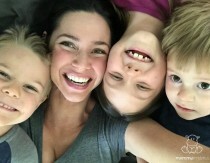 Dawn Gifford writes about sustainable living, gardening and all-things-real food at her blog, Small Footprint Family. 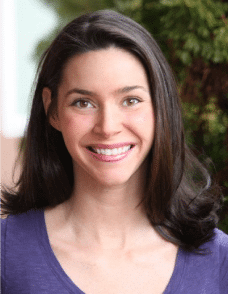 Her aim is to give you the resources you need to make powerful choices that improve your health and well-being—and thereby the health and well-being of our precious planet. Sustainability starts at home, after all. Her forthcoming gardening book, Recipes for Garden Success, will be available this summer. This looks absolutely amazing! I’ll have to try it soon. I grew up eating apricots fresh off my grandma’s trees in the summer, so to me, the taste of apricots is just pure joy! Would like to male this but not sure where to purchase vegetable starter or whey? Any suggestions, thank you. Thank you, i have not yet made yogurt so will order a veggie starter. Cannot wait to try this with my new dehydrator! So if I just use the whey from the coconut milk yogurt I made it will culture the fruit? I’m thinking inch of trying blueberries b/c there’s a big sale Fri & my kids love them. My mouth is drooling over this. I think our apricots will be ready within the month…. I look forward to trying this. Wow, thank you for that recipe. Bookmarkin’ it! I’m fairly new to fermenting…can I use whey from my overcultured milk kefir or does it need to be a non-dairy whey? I cultured my apricots with some whey and when I took it out to dehydrate, the top is covered with mold. This is not normal right? Do I have to just toss it out now? Any advice/help is appreciated! Kristen, I am not an expert when it comes to fermenting so I can’t say for sure. Some say a little mold is fine (just scoop it off) and some say throw it out. Did you happen to use an airlock? 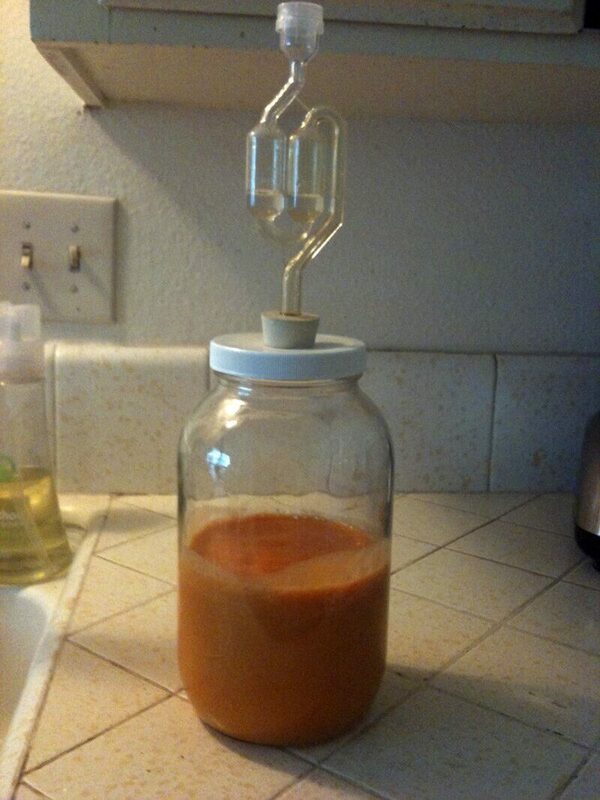 I didn’t have an airlock but I did use a glass container that has a flip top lid. I am a little wary of just scooping off the mold and still using it though. Have you ever tried that? Just pinned this to my pintrest page! While other kids had lunches packed with fruit roll ups and hostess snack cakes, we always had fruit leathers and (as a rare treat) tiger milk bars 🙂 I would love to win the Dehydrator to be able to make my kids these home fruit leathers! Love your blog! Save the pit, it has a seed in it. B-17, Research it! Can I use saurkraut juice instead of whey? I am going to try this- looks wonderful, mouthwatering and FUN. 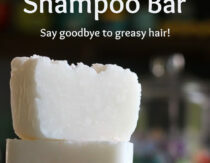 My children would love to make this too. Hello! I just made a batch of this, and I’m excited…but…these instructions say to prepare the veggie culture starter according to package directions, then add to the apricot mix. My veggie culture starter requires 2 cups water with 1 tbs salt + 1 cup water for the start…that would mean I’m adding 3 cups of water to the mix, which would really water it down too much. I ended up just putting the packet directly in my apricot mix, and I’m not sure that will work. Any suggestions on how to prep my starter without so much water?